Last Thursday through Saturday, 11 student diplomats competed in the highly regarded Lobo Model UN (MUN) Conference organized by the UNM World Affairs Delegation. Bobcat delegates included Hedy ’19, Tyler ’19, Vera ’19, Aviva ’20, Julian ’20, Mari ’21, Anna ’22, Constance ’22, Josie ’22, Miel ’22, and Stephanie ’21. LoboMUN is in its 13th year at the University of New Mexico. 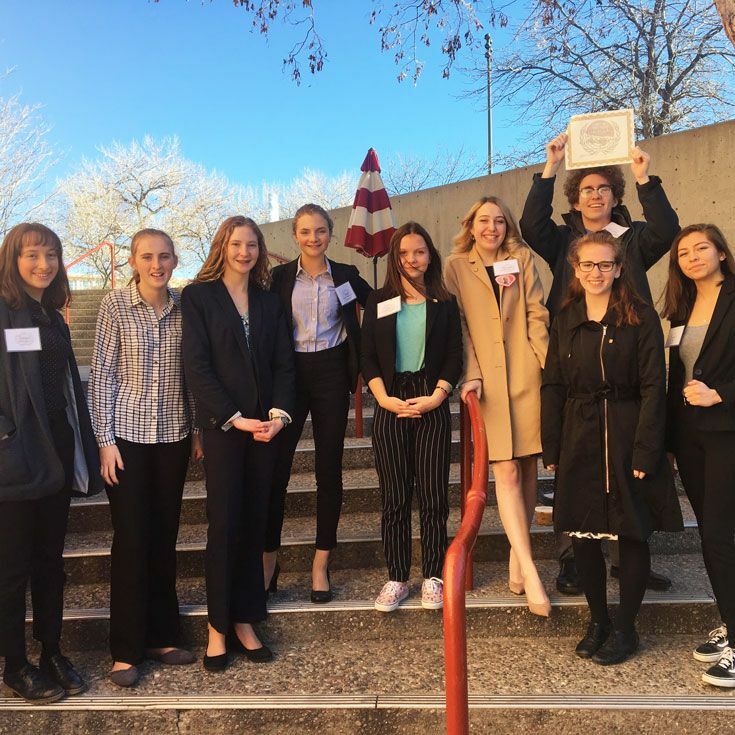 The conference has grown every year, and offers New Mexico high school students the opportunity to participate in a full Model United Nations Conference. This year, the topics and committees ranged from traditional Model UN committees that deal with world health and security issues to a special Hunger Games crisis committee dealing with the outbreak of the Second Rebellion. Across committees, delegates gained essential skills in debate, negotiation, and response to global crises. All our delegates did a fine job at the conference, but four had an especially strong conference and were recognized by the judges for their performances. Tyler: Best Delegate, Hunger Games Committee–a sophisticated political simulation of the Hunger Games series. Vera: Distinguished Delegate, Security Council–this year the SC went back to the future, to 2030, and explored climate-related world conflicts. Julian: Distinguished Delegate, International Criminal Court–judges from all over the world adjudicated international cases, including a war crimes trial of a 94-year-old former Nazi. Miel: Honorable Mention, International Atomic Energy Agency–Miel and her delegation helped to avoid a nuclear conflagration with a rogue North Korea, and resolved other pressing issues such as acquisition and disposal of nuclear fuel. “While we’ll surely miss our graduating seniors, our returning team shows promise for next year,” added Mr. Barr. Congratulations to all of our Bosque Model UN students for great work at the LoboMUN Conference!